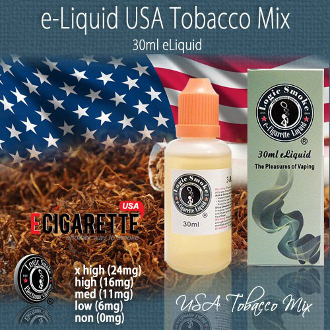 Our USA Mix e Cigarette Juice from Logic Smoke is just the thing if you are looking for a good tobacco flavor that reminds you of smoking a real cigarette. USA Mix is a pleasant blend of rich tobacco and a smokey flavor to give you the illussion of a light cigarette. Pick up a bottle of Logic Smoke USA Mix E-liquid and satisfy your craving. The 30ml bottle is a convenient and economical size for purchasing in quantity. Fill your clearomizer or other e Cigarette Juice atomizing device directly from the bottle or use it to refill your smaller travel-size e-liquid bottles. You'll be ready and have liquid on-the-go at any time.